by Hanly, Jeri R.; Koffman, Elliot B. NOTE: You are purchasing a standalone product; MyProgrammingLab does not come packaged with this content If you would like to purchase MyProgrammingLab search for ISBN-10:0134243943 /ISBN-13: 9780134243948. That package includes ISBN-10: 0134014898 /ISBN-13: 9780134014890 and ISBN-10: 013425399X /ISBN-13: 9780134253992. 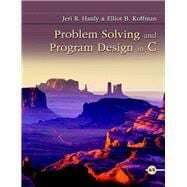 This title is also available with MyProgrammingLab – an online homework, tutorial, and assessment program designed to work with this text to(engage students and improve results. Within its structured environment, students practice what they learn, test their understanding, and(pursue a personalized study plan that helps them better absorb course material and understand difficult concepts. Students, if interested in purchasing this title with MyProgrammingLab, ask your instructor for the correct package ISBN and Course ID. Instructors, contact your Pearson representative for more information.